Denna produkt ger dig 2987 bonuspoäng. 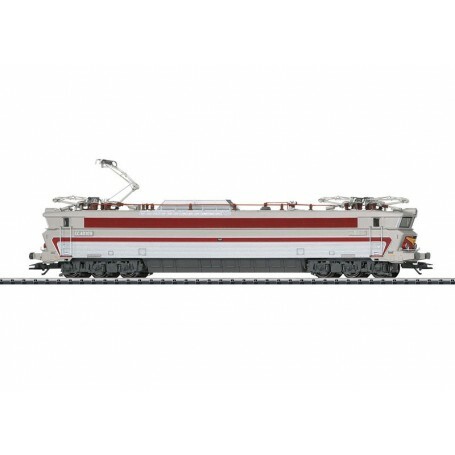 Ellok klass CC 40100 typ SNCF, loket har digitaldekoder och ljudmodul, högeffektsdrivning, motor med svänghjul, drivning på 4 axlar via kardan, slirskydd, ljusväxling, längd över buffertar 25,3 cm, epok IV. Prototype: French State Railways (SNCF) class CC 40100 express locomotive. Four-system locomotive for all of France, the Benelux countries, and Germany. Road number CC 40109. Used in international TEE service. The locomotive looks as it did around 1974. Model: The locomotive has a digital decoder and extensive sound functions. It also has high-efficiency propulsion with a flywheel, centrally mounted. 4 axles powered through cardan shafts. Traction tires. The triple headlights and dual red marker lights change over with the direction of travel, will work in conventional operation, and can be controlled digitally. Warm white and red LEDs are used for the lighting. The locomotive has separately applied metal grab irons. It also has separately applied steps. The roof equipment is detailed, and the locomotive has different pantographs. The engineer's cabs have interior details; the front one has a figure of a locomotive engineer. Equipment parts are included that can be attached to the buffer beams. Length over the buffers 25.3 cm / 9-15/16'.